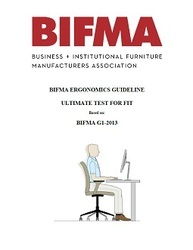 The purpose of this Guideline is to provide guidance to designers and specifiers in developing, designing and specifying ergonomic solutions for computer workspaces in North America. The relevant measurable ergonomic principles and design requirements are found in ISO 9241-303 and 9241-5. The dimensions and adjustment ranges of components are based on the anthropometric data provided in CAESAR (June 2002), weighted to the United States population demographics from the National Health and Nutrition Examination Survey (NHANES) 2007-2008 and 2009-2010 datasets. Other tasks may require considerations not addressed in this Guideline. Note: G1 is a Guideline not a Standard; the dimensions given within the G1 document are recommendations not requirements. 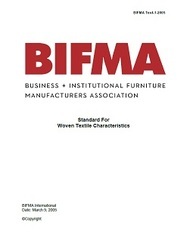 The committee intends this document to be primarily used to give design guidance to manufacturers of furniture to be used in office workspaces. 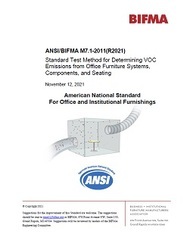 It is expected that specifiers/customers will want to use this document to determine their purchasing specifications. It should be noted that this document does not make specific recommendations for some product dimensions. This is due to the complexities inherent in some of these areas; they are presented in the G1's discussion sections. In some cases, a manufacturer will provide information pertaining to the percentile of the user population their product(s) will accommodate.